Close to a million people have been evacuated and almost 30,000 fishing boats have been recalled to port as Typhoon Chan-hom approaches Sheijiang on the East China coast. CRI: More than 865,000 people in the eastern Chinese province of Zhejiang have been evacuated as super Typhoon Chan-Hom, the second typhoon to hit China in two days, approaches. A total of 28,764 ships had been recalled to port as of 10 p.m., Friday, and several cities were already reporting heavy rain and strong gales, the provincial flood, typhoon and drought headquarters said. The National Meteorological Center (NMC) issued a red alert, the highest level, on Friday morning for the super typhoon. At 0900 local time on Saturday, the typhoon was around 115 kilometres southeast of Zhejiang province over the East China Sea and forecast to make landfall in Zhejiang on Saturday in the afternoon. 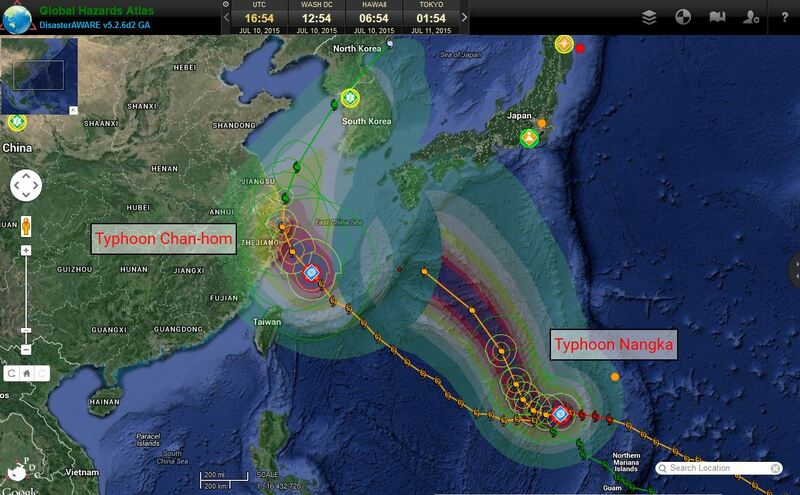 It could be the most powerful typhoon to hit the area since 1949. Mt. Sinabung started erupting on 27th August 2010 after being dormant for 400 years. It has caused evacuations a number of times and has then quietened down only to start again a few weeks later. Lava flows have reached some 5 km from the summit on a number of occasions. 16 people were killed in early 2014. Mt. Sinabung gives the impression of building up for what could be the next VEI5+ volcanic eruption. One visual indicator is the size of the lava dome building up though it cannot be predicted as to how large a lava dome can get before it collapses. Multiple small collapses are much preferable to a single large collapse. But this lava dome has now grown to about 3.3 million cubic metres. The shape and size of lava domes varies greatly, but they are typically steep-sided and thick. The thickness can range anywhere from a few meters to nearly one kilometer in height. The diameter or length of these domes can range from a few meters to many kilometers. The form that the dome takes is a function of many factors including strength and viscosity of the lava, as well as the slope of the land they are erupted onto. “In today’s eruption, Sinabung’s hot clouds simultaneously moved to the south and southeast. The hot cloud releases to the south reached 3,500 meters, or farther than the ones in the southeast, which reached 2,500 meters. This is because the lava dome is in the southern side of Mt. Sinabung,” Deri told The Jakarta Post on Sunday. He said Mt. Sinabung still had a huge potential to erupt as the volume of its lava dome was still quite large. “From the latest data, the volume of Mt. Sinabung’s lava dome has reached 3.3 million cubic meters. Eruptions previously occurred have not yet fully abolished its lava dome; thus, there is still a potential for massive eruptions,” said Deri. Pyroclastic flows are caused by collapse of parts of the lava dome. On 14th June around ten flows were observed descending to the south-east and through the east-North-east channel. The news today about the riots and looting currently ongoing in Baltimore got me to wonder why in 2015 such behaviour is still possible in the US? Even with a black (or more accurately, half-black) President and a black Attorney General (Holder followed by Lynch). One hundred and fifty years after the Civil War, and after over 5 decades of “affirmative action”, why are “African Americans” still at the bottom of all social and economic league tables in the US? Why are they – as a group – being overtaken even by the “new immigrants” from Asia? Could it be that the efforts to lift the African American community have been misguided, or that the particular measures on offer have not been capable of being received? Take the situation in Nepal. There is much international help on offer but much is not getting through because of the limitations on the ability (infrastructure and personnel) to receive it. The current death toll of over 4,000 may turn out eventually to be closer to 10,000 . Planes arriving in Kathmandu have been slow in being unloaded and then the relief supplies have been stuck on the ground because many of the airport workers have left for their own damaged homes and injured relatives. The airport was never designed to handle this level of traffic. The aftershocks are continuing and everything comes to a halt when one occurs. Relief and medical teams from India and China remained undeployed for many hours because there was nobody available to direct them where to go. And when the “authority” of who would decide was settled, they had no information as to where the teams could be best deployed. Infrastructure was poor in any case but is now damaged. Highways into the remote areas are blocked. Power and water distribution has been hit hard. Foreign teams arriving in Kathmandu have not had the local support necessary readily available. In fact, just finding the necessary support for the foreign teams (guides, interpreters, vehicles, maps, intelligence) itself has overloaded the few organised resources available. The Nepalese Army is overwhelmed. Many Gurkha villages have been hard hit and the primary concern of some of these Gurkha soldiers is to get to their villages and their relatives. Even in Kathmandu itself – let alone relief and rescue in remote areas – heavy lifting equipment is limited. Even when available they cannot reach “at least 19” areas of the city because of the narrow lanes which have to be negotiated or because of rubble blocking their access. It is often underestimated or forgotten that the provision of anything (help or education or technology) – once the will to provide is established – is still restricted by the ability to receive. I am reminded of the struggles we had with “technology transfer” where the will and readiness to transfer technology was often restricted by the ability to receive and absorb technology. I recall that our efforts to open new factories in rural areas were severely limited by the ability of local villagers to absorb the change from working in a field to working in a factory. The ability to receive trumps the will to give. 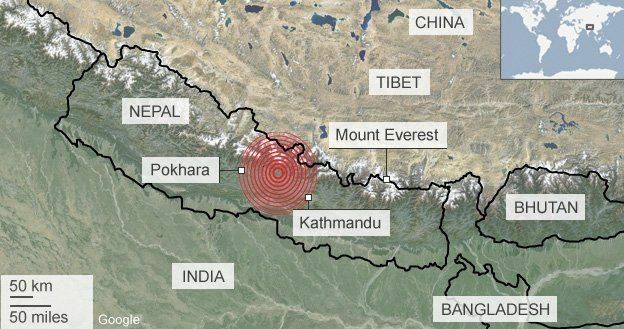 This earthquake in Nepal – devastating as it was – has not released enough of the pent-up strain under the Himalayas. The death toll now exceeds 3,500 and most are due to collapsing buildings. It would need about 50 such quakes with magnitude 7.9 or one super quake of magnitude 9 to release all the slip built up over centuries. The Indian tectonic plate is being subducted under the Eurasian tectonic plate with the Indian Plate moving North East at about 6 -7 cm per year while the Eurasian Plate is moving Northwards at about 2 cm per year. There is a net 2 – 3 cm of slip to be accumulated – or to be relieved by some form of energy release – every year. The Great Himalayan Earthquake has still to come. The scale of loss of life and devastation will be magnified greatly if the Great quake is located in the central Himalayas such that the tremors extend into the densely populated Gangetic Plain. The central Himalayas have not seen any large quakes for about 700 years and the pent-up energy is ominous. It is highly unlikely that either in Nepal or in the vulnerable regions of India, that buildings will be sufficiently “earthquake-proofed” to minimise the loss of life (and over 90% of the loss of life is due to the collapse of buildings). Down to Earth: … It has been hypothesised for long that a large earthquake, called the “great Himalayan earthquake”, can strike anytime, but its time and place cannot be predicted. In many locations in the Himalayan belt there is enough energy stored currently to lead to one. At a magnitude of 7.9 on the Richter scale, the April 25 earthquake has caused devastation but it is not the anticipated “great Himalayan earthquake”. This does not qualify as a great earthquake which needs to be of magnitude 8, says Roger Bilham, geologist with the University of Colorado Boulder who studies the seismicity of the Himalayan area. “The earthquake is in a region that is being compressed by18 mm each year,” he says. The amount today’s earthquake slip would have been exactly right to release all this accumulated stress, he adds. His team has identified some areas where the great Himalayan earthquake is anticipated (see image). The question mark shows the area where an earthquake is potentially possible but the magnitude is not known. “This (Nepal earthquake) has unfortunately not come as a surprise. We expected an earthquake of high magnitude in the region between Kathmandu and Pokhara,” says Paul Tapponnier from Nanyang Technological University’s Earth Observatory of Singapore who also studies earthquakes in the area. Tapponnier’s earlier work showed that the quakes in 1255 and 1934 were ground-breaking quakes or when ruptures develop in the earth’s crust and the pent up energy in the earth is released. As the areas west or east of the 1934 Nepal ground rupture do not have records of earthquakes, they are at a greater risk of a major earthquake. In a paper published just two months ago scientists from the Jawaharlal Nehru Centre for Advanced Scientific Research conclude that “the frontal thrust in central Himalaya may have remained seismically inactive during the last ~700 years. Considering this long elapsed time, a great earthquake may be due in the region”. The Himalaya has experienced three great earthquakes during the last century—1934 Nepal-Bihar, 1950 Upper Assam, and arguably the 1905 Kangra. Focus here is on the central Himalayan segment between the 1905 and the 1934 ruptures, where previous studies have identified a great earthquake between thirteenth and sixteenth centuries. Historical data suggest damaging earthquakes in A.D. 1255, 1344, 1505, 1803, and 1833, although their sources and magnitudes remain debated. ….. Age data suggest that the last great earthquake in the central Himalaya most likely occurred between A.D. 1259 and 1433. While evidence for this rupture is unmistakable, the stratigraphic clues imply an earlier event, which can most tentatively be placed between A.D. 1050 and 1250. …. Rupture(s) identified in the trench closely correlate with two damaging earthquakes of 1255 and 1344 reported from Nepal. The present study suggests that the frontal thrust in central Himalaya may have remained seismically inactive during the last ~700 years. Considering this long elapsed time, a great earthquake may be due in the region. “We know there is a huge amount of accumulated strain in this area. It is due for a major earthquake, perhaps a series of earthquakes, bigger than 8 on the Richter scale. That is the kind of energy that is estimated to be accumulated there. This was certainly not one of those earthquakes that is probably imminent. In terms of energy release, I would say this would not have released even four or five per cent of the energy that is estimated to be stored there,” said Harsh K Gupta, former director of the Hyderabad-based National Geophysical Research Institute and a former member of the National Disaster Management Authority. Prof Sankar Kumar Nath of IIT Kharagpur, who has studied seismic activity in the Himalayan region, said the energy released from Saturday’s earthquake “was equivalent to the explosion of about 100mn tonnes of TNT, comparable to the energy in detonation of small nuclear bombs”. “This earthquake would only be classified as medium in terms of energy released. That area, the 2500-km stretch from the Hindukush region to the end of Arunachal Pradesh, is capable of generating much bigger earthquakes, even nine on Richter scale,” he said. “If you look at it differently, we are actually lucky that only a 7.9-magnitude earthquake has come. I would be very happy to have a few 7.9-magnitude earthquakes than a 9-magnitude earthquake which would be absolute disaster. The trouble is that in terms of energy release, which is what causes the damage, it would take 40 to 50 earthquakes of magnitude 7.9 to avoid an earthquake of magnitude 9,” he said. A strong 6.7 magnitude aftershock hit Nepal this morning, 25 hours after the primary quake, as the death toll continues to climb. At least 30 shocks of magnitude greater than 4.0 have been felt. Kathmandu airport which was open has been closed till 4pm local time because of the aftershocks. Rescue efforts have been put on hold while the aftershocks continue. Air Traffic Control staff have been evacuated from the airport for now. Indian Air Force Mi-17 helicopters reached Mount Everest and began ferrying injured back to Kathmandu with the first relief flights reaching this morning. So far the IAF has deployed 5 helicopters and another 6 are on their way. It is feared that 65 mountaineers on Mt. Everest may have been killed at the base camp and in the avalanche yesterday. The aftershocks have caused at least 3 further avalanches on Everest today. Tremors from the aftershocks have been felt in Delhi, UP, Bihar, W.Bengal, and Assam. The final toll may exceed 2,000 as rescuers reach more remote regions. Both India and China see Nepal as being within their natural “sphere of influence” and a hint of that competition is visible as the two countries now lead the international rescue efforts. In addition to a Chinese medical team that was already in Nepal, three further medical teams from neighboring Sichuan, Chongqing and Yunnan have gone to Tibet. Xinhua:A 62-strong China International Search & Rescue Team left for Nepal early Sunday. With six sniffer dogs and relevant rescue and medical equipment, the team is expected to arrive in Kathmandu midday Sunday on a chartered plane, according to the China Earthquake Administration. India sent two relief planes of air force to disaster-struck zones hours after the quake took place. Indian Prime Minister Narendra Modi called up his Nepalese counterpart Sushil Koirala, and assured him of all help. Two military aircraft, a C-130 Hercules and a C17 Globemaster, took off from the Hindon air base in Delhi to Kathmandu with relief workers, medicines and blankets, said Press Trust of India. Disaster teams from the UK, US and Israel are already on their way as well and many other countries have offered assistance. If a great earthquake has not occurred on a specific segment in the Himalaya for 200 years, that segment will slip 4m because the convergence rate between India and Tibet is roughly 2cm each year. If it has not occurred for 500 years the segment would slip 10m, enough for an event that would measure 8, or Magnitude Eight on the Richter Scale. The time interval between great earthquakes thus determines the amount of slip that will occur in the next one. …. A large segment of the Himalaya between Kathmandu and Dehradun has a record of several earthquakes but only two large ones: an event in 1803 and another in 1833. If these were great earthquakes then there is now roughly 3m of slip ready to go. However, if they were magnitude 7 earthquakes, then there may be more than 20m of slips availabIe for a future great earthquake. It would seem that this earthquake near Kathmandu was a large one (7.8 magnitude) and may have released around 5 – 8 m of slip but as has been pointed out there may be a total of around 20m of slip waiting to occur. The current quake has so far seen some 16 aftershocks of magnitude 4.5 or greater. Deaths in India are over 40 and the Indian government is mounting a large rescue effort in support of the Nepali government, “Fifty doctors have arrived from India to provide emergency services. India dispatched as many as four aircraft including a C-130 plane carrying three tonnes of relief supplies and a 40-member rescue team to Nepal.” Three more planes are to follow carrying a mobile hospital and medical supplies. FirstPost: The quake measuring 7.9 on Richter scale, which was followed by 16 aftershocks of magnitude 4.5 or greater, striking heavy casualties in Kathmandu and injuring thousand others. Hundreds were feared missing across the country. “Army estimates death toll as much as 1457 so far,” Nepal’s Finance Minister Ram Sharan Mahat tweeted. ……. The earthquake around 11:56 am with epicentre at Lamjung, around 80 kilometers northwest of Kathmandu, had its impact in several cities in Bihar, West Bengal and Uttar Pradesh and tremors were felt across vast stretches of east and North East India. It was also felt in Southern and Western parts of India, China, Bhutan and as far as Pakistan and Bangladesh. The April 25, 2015 M 7.8 Nepal earthquake occurred as the result of thrust faulting on or near the main frontal thrust between the subducting India plate and the overriding Eurasia plate to the north. At the location of this earthquake, approximately 80 km to the northwest of the Nepalese capital of Kathmandu, the India plate is converging with Eurasia at a rate of 45 mm/yr towards the north-northeast, driving the uplift of the Himalayan mountain range. The preliminary location, size and focal mechanism of the April 25 earthquake are consistent with its occurrence on the main subduction thrust interface between the India and Eurasia plates. Although a major plate boundary with a history of large-to-great sized earthquakes, large earthquakes on the Himalayan thrust are rare in the documented historical era. Just four events of M6 or larger have occurred within 250 km of the April 25, 2015 earthquake over the past century. One, a M 6.9 earthquake in August 1988, 240 km to the southeast of the April 25 event, caused close to 1500 fatalities. The largest, an M 8.0 event known as the 1934 Nepal-Bihar earthquake, occurred in a similar location to the 1988 event. It severely damaged Kathmandu, and is thought to have caused around 10,600 fatalities. Was this the big earthquake that was predicted in the Himalayas? High resolution imagery and dating techniques showed that in 1255 and 1934, two great earthquakes ruptured the surface of the Earth in the Himalayas. The 1934 earthquake broke the surface over a length of more than 150 km. It has been 24 years since the last VEI 5+ (Mount Pinatubo, 1991, VEI 6) occurred and the probability that a VEI 5+ volcanic eruption will occur within the next 5 years is now over 95%. There are around 10 – 14 VEI 5+ eruptions every hundred years and for the the last 300 years the time between eruptions has been as short as 1 year and as long as 23 years. The current gap could be the longest recorded in three centuries. There are, on average, 2 eruptions of intensity 6 every hundred years and so the probability that an eruption of VEI 6 could occur within 5 years is about 50% (current gap 24 years, average gap 50 years). 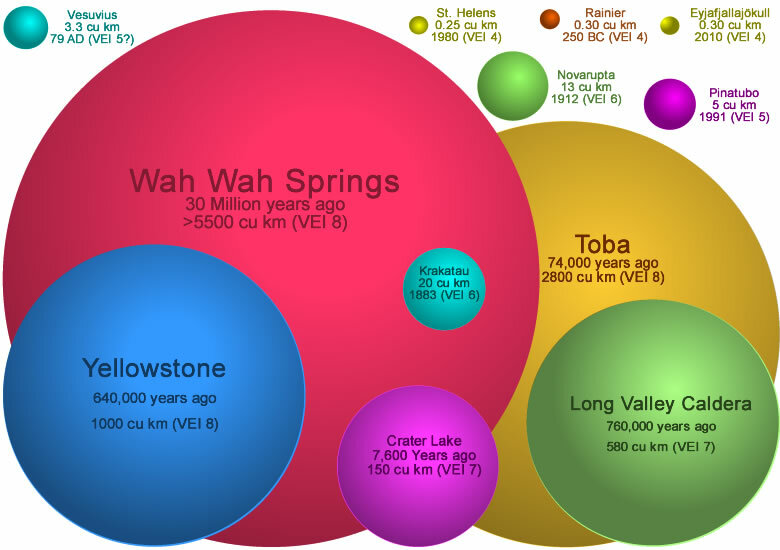 That a supervolcanic eruption of VEI 7 or greater could occur within the next 5 years is less than 1%. The next VEI 5+ volcanic eruption is overdue During the 19th century VEI eruptions of 5 or greater occurred every 11 years on average with the Krakatoa eruption being the greatest at VEI 6 in 1883. Through the 20th century, an eruption of intensity 5 or greater came at intervals varying from 1 year upto 23 years with an average interval of just under 7 years. The Novarupta (1912) and Mount Pinatubo (1991) eruptions were the two classified at VEI6. The impact of the next eruption has to be assessed in a short and a long-term perspective. Immediate loss of life and property is primarily a function of population in the area of the eruption and the time available for evacuation. Populations are higher now than ever in the past but warnings come earlier and possibilities for evacuation are better than ever before. The population directly at risk from volcanoes in the year 2000 has been estimated at 500 million or more, The long-term impacts could be much more profound and independent of the location of the eruption. We are already into an ocean- current led global cooling cycle. We could well have another year or two without a summer after the next VEI 5+ eruption. The key will be the extent of the dust cloud, the altitude it reaches and for how long it persists. It will not be a Toba like cataclysm which affected the evolution of humans, but it may well be the impulse which drives the earth into an Ice Age. It could even be the start of a 1000 years of transition back into a Glacial Age since the current Interglacial has been around for some 15,000 years. 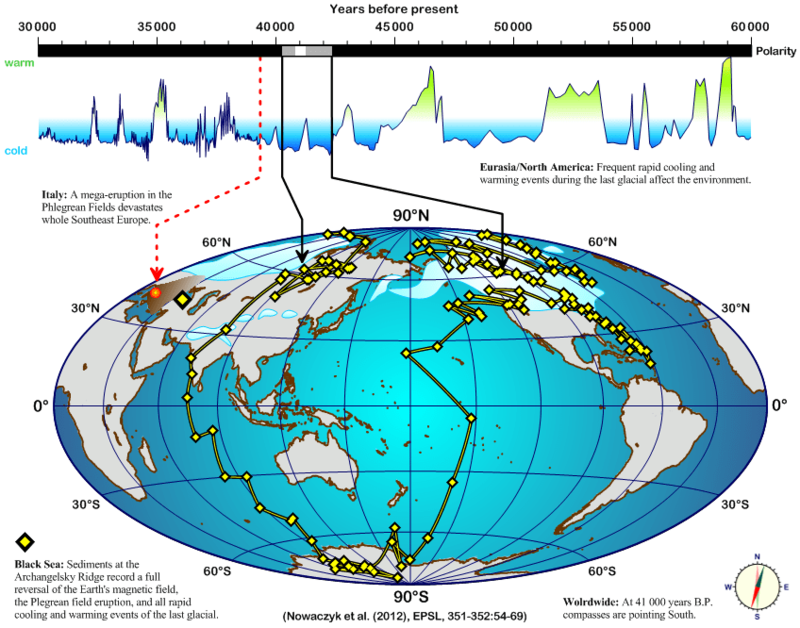 Extreme Geohazards: Reducing the Disaster Risk and Increasing Resilience VEI values have been determined for more than 5,000 eruptions in the Holocene…. None of these reached the maximum VEI of 8. Several of the most devastating eruptions during the last 2,000 years had VEI values lower than 6. For example, the VEI 5 eruption of Vesuvius in 79 AD destroyed Pompeii and Herculaneum. Since 1500, more than 20 eruptions of VEI 5 or more occurred, with only the Tambora eruption in 1815 reaching VEI 7. It is worth noting that the extremely disruptive eruption of Eyjafjallajökull only reached an estimated VEI of between 3 and 4. …… The size and magnitude of …. the eruption, is only loosely related to the resulting damage. For example, mudflows triggered by the VEI 3 eruption of Nevado del Ruiz (Colombia) in 1985 caused one of the worst volcanic disaster in the 20th century. …… of the nine greatest volcanic disasters in terms of casualties since 1500, only three (Tambora, Krakatau and Laki) qualify as ‘very large’ eruptions with a VEI of greater than 5. ….. during the past 36 Ma, 42 VEI 8 eruptions have been identified. The authors indicate that these eruptions are not evenly distributed in time but seem to cluster in two pulses over the past 36 Ma. Periods with as many as 22 events/Ma and down to 1.4 event/Ma have been identified. More recent examples are the eruptions of Taupo (around 24,000 BC), Toba (around 74,000 BC), and Yellowstone (around 640,000 BC), for which the impacts have been studied in detail. More recent large eruptions with a VEI of 5, 6 or 7 include Thera (≈1630 BC), Vesuvius (79 AD), Laki (1783), Tambora (1815), Krakatau (1883), Novarupta (1912) and Pinatubo (1991). 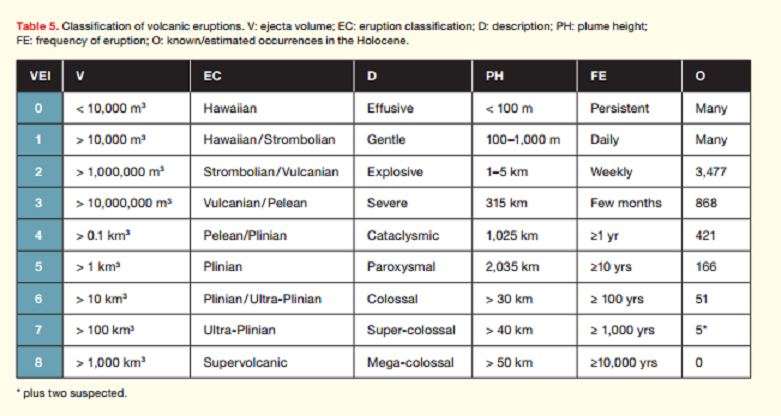 Each of these eruptions (except Novarupta, due to the remoteness of the area) generated immediate loss of life and structures at local distances (through the generation of pyroclastic flows, ash and gas emissions, tsunamis) as well as long-term losses at regional and global distances. These eruptions impacted the climate for long periods by injecting ash in the stratosphere at high altitudes (Tambora’s ash column height reached 43 km) and triggering temperature changes which heavily impacted the harvest and led to famine and epidemics in several areas of the planet: the year 1816, following Tambora’s eruption, is recalled as ‘the year without summer’, and generated abnormal temperatures in China, Europe and North America. The hypotheses about man made global warming are neither predictable or measurable and are just fancies. But volcanic eruptions are neither fanciful nor amenable to prediction. They will occur and we have no means of preventing them. Within 5 years it is close to a certainty (> 95%) that a VEI 5+ volcanic eruption will occur. With global mobilisation loss of life can be minimised but the effects of the eruption on climate will just have to be endured. Swedish Social Services received a request yesterday to accept a UNICEF worker smitten with Ebola for treatment. They merely responded with a demand for more information and when they did not get that information they rejected the request. They got it wrong I think. I imagine the request was urgent in an effort to find a place willing and capable to treat the unfortunate UNICEF worker. The correct response should have been “Yes, in principle, subject to practical feasibility”. To note the limitations or constraints on what help could be provided would have been perfectly in order. But just a counter-request for more information would have been taken – and rightly so – as prevarication and a fundamental unwillingness to help. I hope that some country with suitable medical services has accepted the unfortunate patient. From my little experience of emergency situations, the bottom line is that emergency requests for help must be answered YES or NO, and not just generate requests for further information. A YES can – and must – be qualified with the constraints or limitations of what help can be provided. The requests usually originate from the “front line” (whether disease or earthquake or tsunami or typhoon) and it is unreasonable for those receiving requests for help, to burden those at the “front” with more bureaucratic requests for information. Responses must be for the sake of being helpful for those at the “front line” to take a call and make decisions and take actions. A response cannot be – as in this case – something which makes it more difficult for the “front line” to act. (I would give Fukushima as an example. When the plant engineers and managers at the Fukushima nuclear plant requested permission from Headquarters in Tokyo to use sea water for emergency cooling – which they well knew would permanently disable the plant – TEPCO HQ responded by asking for more information. The “front line” at the plant knew they were no other options but the lack of clear response and unending requests for more information from Tokyo led to many hours (about 6 hours) being lost). As a response from someone called the “Emergency Management Director” of the National Social Service Board, Sweden’s response left a lot to be desired. On Thursday, Sweden received a request to receive a suspected Ebola infected person who worked for UNICEF in Sierra Leone. But the reflection period was too short and the information was very sketchy and therefore rejected by the National Social Services Board writes expressen.se. “We had no medical information in general, and requested it, but received no such information. Therefore it was hard to know what to say yes to and what to prepare”, says Johanna Sandwall, emergency management director on the National Social Services Board. I would suggest that the National Social Services Board has not yet distinguished sufficiently between normal processes and emergency procedures. I take it for granted that Sweden, in fact, does want to assist and is probably among the more capable countries for treating patients.